For the complete novice or seasoned pro – our kayaks are great fun and give you the chance to view Lymington River from a totally different perspective!! Kayak Hire Lymington is the perfect way to spend a few hours out on the water! There’s lots to see as you take a leisurely paddle along the Lymington River – meandering through an eclectic mix of different boats on their river moorings and past Lymington’s two prestigious Marinas. 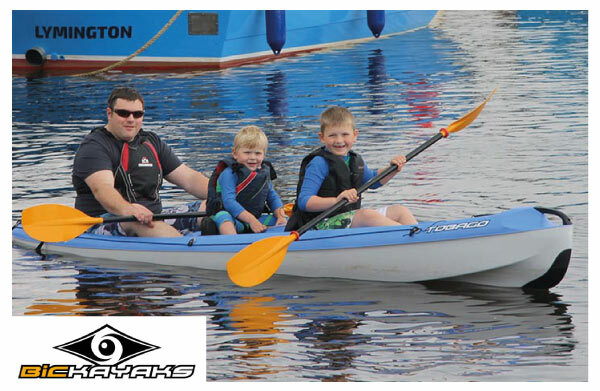 We have a growing hire fleet of sit on top kayaks, ideal for individual paddlers, or family kayaks that can take 2 adults and a child. All of Lymington Kayaks’ boats have been specially chosen for their stability and straight line performance. For the more novice kayaker, you can head briefly up river under the railway bridge where you can practice your technique in quiet shallow waters, before heading down river. Then, as you head down towards the protected saltgrass marsh, you may see a wide range of wildlife including, gulls, terns and various waders and diving birds. You may also see bass jumping out of the water and mullet eating the algae off of the hulls of moored boats. The river has also been visited by seals and porpoises in the past – so keep an eye out for Sammy the Seal! For the more adventurous of you, once you have paddled past the wave screens you can head west into Oxey Lake, or East into Pylewell Lake, raft up for a spot of picnic lunch before returning to Lymington Quay – what could be better!? So if you’re stuck for something to do on your New Forest holiday – why not hire a Kayak from us? You can find us on Lymington’s Historic Quay.